While concentration and oxygen cells are responsible for perhaps 90% of the corrosion in soils and natural waters, other cells such as the temperature cell shown below may be still quite damaging when they get established. In such cells, the two electrodes are of the same metal, but one is maintained at a higher temperature than the other by some external means. In most cases, the electrode at the higher temperature becomes the anode to cause what has been called thermogalvanic corrosion. This is a particularly unfortunate type of cell because the high temperature just outside the compressor tends to damage the coating, so that the part of the line which is the anode is also likely to have the poorest coating. External corrosion of underslab, copper, hot water tubing has resulted in a great deal of construction defect litigations due to this type of corrosion . Oil and gas well casings also experience similar cell attack. 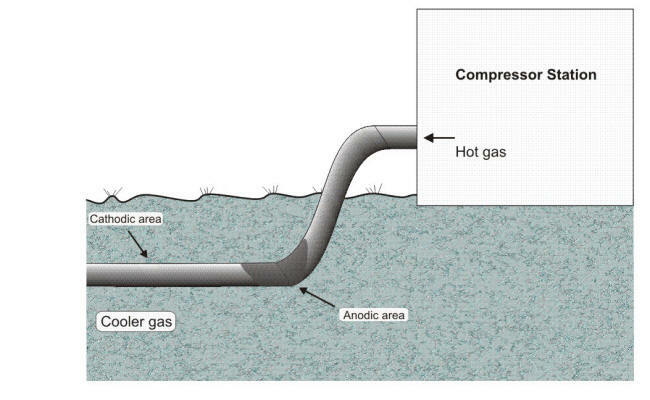 The pipe at some depth below the surface is at a higher temperature (this is a natural phenomenon; temperature increases with depth) and thus becomes the anode, the cooler pipe near the surface and the surface piping make up the cathode, the soil is the electrolyte, and the pipe is the connection.